Atlanta Dance Central Presents Seasons of Dance! It’s the most exciting time of year here at Atlanta Dance Central! Students have been working extremely hard since September, perfecting new dance moves and learning new choreography. It is their time to shine as they show family and friends what they have been working on. Atlanta Dance Central will be presenting it’s fourth annual recital on Saturday, May 11, at Blessed Trinity High School in Roswell, GA.
“Seasons of Dance” will be split up into three seperate performances. There will be 2 shows featuring our Kinder students at 11 a.m. and 2 p.m. The youth recital will be at 7 p.m. The Foster-Schmidt Dance Academy for Down Syndrome will also be performing. Over 200 local Roswell students will be performing in the show, ranging in ages from 3-18. Students will showcase their talents in jazz, tap, contemporary, musical theater, acrobatics, hip hop, and will even be performing in an original Atlanta Dance Central ballet! This year there is even a new “Daddy Daughter Dance,” that is too cute for words! 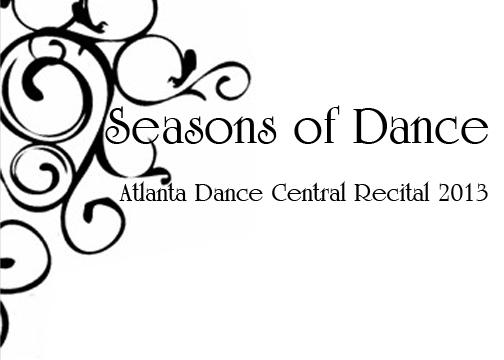 Tickets for “Seasons of Dance” are available on the Studio Events page, and at Atlanta Dance Central. Faculty and students are extremely excited to share their passion for dance with the community! You will not want to miss it! Previous Post: « Student of the Month: Sarah Rogers!